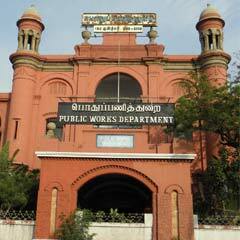 The Tamil Nadu Public Works Department is as old as the British rule in India. It was in the year 1858 that India came directly under the British crown after the First War of Independence in 1857, which was designated by the British historians as the Sepoy Mutiny. It was in the same year, namely 1858, that the Public Works Department was formed based on the recommendations of a Public Works Commission, appointed by the Court of Directors in England. Sir Arthur T. Cotton, of revered memory, was the first Chief Engineer of this newly formed Department. But the origin of this organization could be traced even to still earlier decade, as far back as 1809, when the Engineers under the East India Company were known by various designations, such as "Superintendent of Tank Repairs", "Inspector General of Civil Estimates", and so on. But the name Public Works Department was given only to the new Department formed on the advice of the Home Government in England and the Government of India in the year 1958. All the Chief Engineers, upto the end of the 19th century, were military engineers under the category of Royal Engineers. The first Chief Engineer being Sir Arthur Cotton, who thought of the Ganga Cauvery Link even in those days and carried out many monumental irrigation surveys in the Godavari, Krishna and Cauvery basins, which continue to be useful even upto this day. The next most notable name in the list of Chief Engineers is that of Lr. Col. J. Pennycuick, who planned and executed the Periyar Project in the year 1885-1895 impounding a West flowing river by constructing a dam, boring a tunnel through the Western ghats and diverting it to flow Eastwards for irrigating the Madurai and Ramanathapuram Districts. The next important milestone in the history of PWD is the construction of Mettur Dam across the river Cauvery in the years 1925-1934 after entering into an agreement with the then Princely State of Mysore. Another magnificent scheme executed again in this part of the country in the last two decades is the Parambikulam Aliyar Project in Coimbatore District after the political independence of this country under the dynamic leadership of Er. U. Annada Rao. Modernisation of Periyar-Vaigai Project, Krishna Water Supply Project, construction of many smaller reservoirs and public utility buildings are some of the additions to Public Works Department. 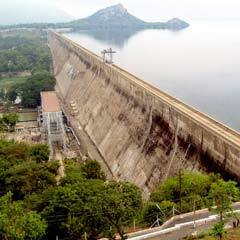 It was almost closely following the completion of the Mettur Dam in 1934, that the Association of Engineers was formed in the year 1936 under the initiative of Engineers C. Seshavataram, M.K. Narambunathan Pillai and Thanikachalam. From then onwards, the Association has been tirelessly working for the welfare of the Engineers and for the advancement of the technical knowledge of its members and for the economic development of this State. We are very proud to record that Dr. (Er.) K.L. Rao was once the President of this Association in the late forties and then he rose to the eminent position of Minister for Irrigation in Government of India and tried his level best to factualise the dreams of Sir Arthur Cotton. We are also proud to have Er. C.T. Radhakrishnan, Er. C.S. Kuppuraj, Er. K.T. Guruswamy, Er. K. Ramalingam, Er. E.N. Nachimuthu, Er. S. Nageswaran, Er. S.M/ Krishnan, Er. M.P. Dorairaj, Er. S.M. Arasu, Er. I.J.J. Arputharaj, Er. R. Paranthaman, Er. A. Veerappan and Er. R.V.S. Vijayakumar as our past Presidents who have been noted for their sincerity, honesty, highest integrity in addition to their interest in uplifting the status of Engineers and growth and fair name of the Department as well. But for their well-merited guidance and active participation in the activities of this Association in the last three decades, it would have been impossible to achieve the present status of the Association which serves as a beacon light to all other Service Associations of Engineers in the State of Tamil Nadu as well as outside this State. Er. A. Veerappan, former President – AOE and General Secretary - AOE, TNPWD was the first General Secretary of Tamil Nadu Engineers' Federation, first founder Chairman of All India Engineers' Federation(INDEF), former Secretary General, INDEF, former President of South India Graduate Engineers Federation (SIGEF) and also the Organiser for the Federation of Tamil Nadu PWD Service Associations (FEPSA). It is appropriate to mention that the present team of Office Bearers of AOE and AEA are contributing much for running the Association activities effectively. Poriyaalar Ramalingam Illam (Rest House) at Chennai with Er. C.T. Radhakrishnan Library and Porignar Kuppuraj Arangam, Poriyaalar Illams at Madurai, Salem, Trichy, Thanjavur, Tirunelveli, Erode, Coimbatore, Nagercoil, Virudhunagar, Pollachi and Taramani. They are used as Rest Houses as well as meeting places for all engineers of TNPWD.